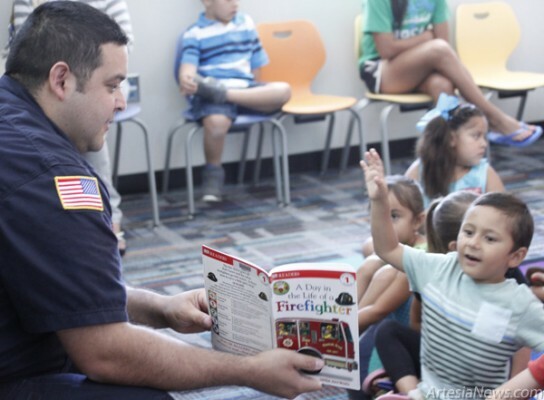 Firefighter Freddie Florez reads “A Day in the Life of a Firefighter” to children this morning during a Fire Safety Fair at the Artesia Public Library. The book and nearly 30 others were donated to the library today by the AFD through a grant from Wal-Mart. Artesia Fire Department firefighters, along with Sparky the Fire Dog, appeared this morning at the Artesia Public Library to educate children about the importance of fire safety. As part of the Child Safety Fair, firefighters read books at story time and showed one of the city’s fire trucks to visiting children. … For the rest of the story, subscribe in print and on the web.